The morning sun is still low in the sky, the air is fresh, and you’re making great time under the leafy canopy of a famous southeastern trail. Does this sound like the perfect Atlanta USATF-Certified Course? If so, then you need to sign up for the Spooktacular Chase! 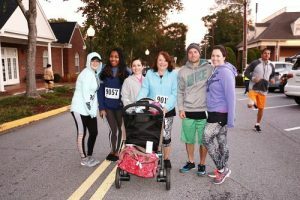 This year’s 10th anniversary race takes place of Saturday, October 13, 2018 and all proceeds will go to the non-profit Vision Rehabilitation Services of Georgia (VRS), an organization that aids blind and vision-impaired people across 33 counties in north Georgia. Why ‘Spooktacular Chase’? Since its being held in October, this AJC Peachtree Road Race qualifier offers a Halloween theme, with many of the participants, cheering, volunteers and spectators decked out in creative costumes. Roughly half of both the 5K and 10K courses will take you along sections of the famed Silver Comet Trail. This paved trail includes stretches of curving boardwalk through the woods – with no other signs of civilization. The Silver Comet, with grades of up to 2%, was originally built along abandoned railroad lines. Were you to run the entire trail, plus its connecting trail in Alabama, you’d cover almost 100 miles of natural landscape from Smyrna to Anniston. Luckily, in October, you’ll only need to complete 3.1 or 6.2 miles, which will also include a mostly green, non-commercial length of Powder Springs Dallas Road which is closed to traffic during the race. 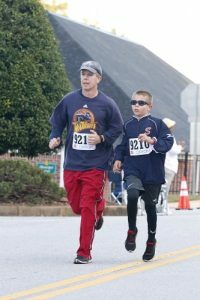 Both the 5K and 10K Spooktacular Chase courses are certified and sanctioned by USA Track and Field. That means your finish time (for either course) can be submitted with your registration for the 2019 AJC Peachtree Road Race to help get you into an earlier start wave. 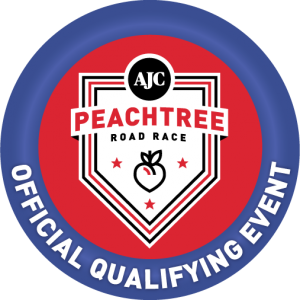 The next AJC Peachtree Road Race will be held on July 4, 2019 and qualifying runs like the Spooktacular Chase are a great way to train for it. Registration for the highly competitive ‘Peachtree’ – the largest 10K in the world – will be held March of 2019, using a random lottery system to select participants (hint: out of 70,000 registrants, 60,000 will make it in). Check out the race details and course map by clicking here. Register to run on Active by clicking here. 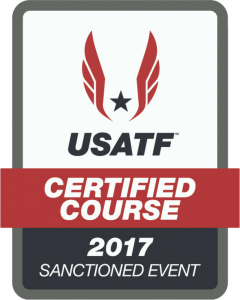 What’s it Mean to be a USATF-Certified Course? USATF-Certified Courses are those that have been evaluated for distance accuracy. These evaluations ensure consistent standards for races throughout the United States, for official record-keeping and national rankings of runners. Of course, it also helps to level the playing field when you want to compare your performance on various courses, or with other runners. Every state has an official USATF Road Course Measurer. Once approved, each course is assigned a course ID number. A certificate is issued, paired with the official course map. In the end, the rigorous USATF-Certified Course system ensures the ongoing integrity of every sanctioned race, and every competitive runner. If you’d prefer to stay more or less in one place during the event, there are plenty of opportunities to volunteer. In fact, the race itself would be impossible without good people donating their time. 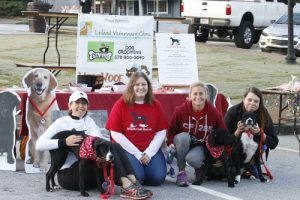 Volunteers of all ages are needed to help set up, work the registration tables, and monitor the course, as well as pass out t-shirts to runners, medals to finishers, and information to spectators. You can find out more information about becoming a Spooktacular Chase Volunteer by clicking here. You can also register as a Phantom Runner; you’ll participate ‘in spirit’ but won’t actually run. Yes, you’ll get a Spooktacular t-shirt (but not a medal). Get a group of 10 or more friends together, and register as a super-supportive Phantom Runner Team. Spooktacular Chase already has some wonderful sponsors. But as each additional sponsor gets on board, the event becomes even more worthwhile, since even more people can be helped by VRS. If you would like more information about sponsorships, please contact Kay Eller at 770-432-7280. The Smyrna-based organization provides vision therapies and life-enhancing services that change people’s lives for the better. Some of the individuals served are blind; others are visually impaired, making it difficult or impossible to carry out the tasks of everyday living that most folks take for granted. When clients, from children to seniors, can’t afford the cost of necessary services, VRS steps in to provide what they need at low cost or no cost. VRS professionals start with comprehensive low vision evaluations, then determine the services that are needed. These might include rehabilitation training, help with orientation and mobility, computer access technology, job readiness training, support groups, and more. Isn’t That All Worth Running for? Do something you enjoy doing, while doing your part to help people in need. 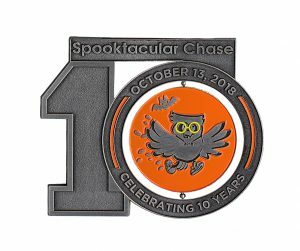 Sign up now to run in this year’s Oct 13th Spooktacular Chase, and see what you can do on a very special USATF-Certified Course.